Moody's recent downgrade of 15 of the world's largest banks, along with JPMorgan Chase's (JPM) multibillion-dollar trading loss on risky derivatives, make it clear that certain big banks aren't as safe as depositors might have hoped. Still, consumers have to keep their money somewhere. While the FDIC guarantees your deposits, it only insures so much, and it offers no help to investors if a bank craters. 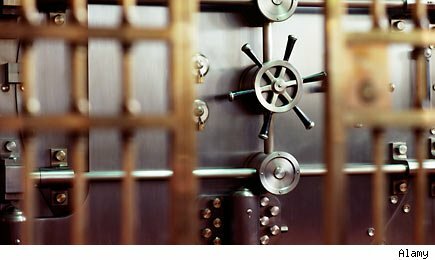 So to help consumers find the best places to stash their cash, 24/7 Wall St. has compiled a list of the safest banks. The criteria were strict, complicated ... and you're probably only interested in the results. We screened for banks with a market capitalization of more than $2 billion. We further screened for banks whose share value is be less than 14 times earnings (P/E ratio). The share price to book value had to be less than 2.0. The bank had to have a minimum return on equity of 8% or more. To demonstrate how confident a candidate bank is, it had to pay its common holders a dividend yield of 2.0% or higher. We also only chose financial institutions with an investment grade credit rating by ratings agencies, and Wall Street analysts had to value the bank's share price above the current price. We also didn't consider regional banks with fewer than 100 branches. All but one stock of the banks on our list trades above $10 per common share. We also gave preference if Warren Buffett and Berkshire Hathaway (BRK-A) is an owner of the common shares. We remained focused on the top 50 banks by assets with a large retail banking presence, so even though the fiduciary banks of State Street Corporation (STT) and Bank of New York Mellon (BK) fit our initial screening criteria, they were not included. The 'problem banks,' which include Citigroup Inc. (C) and Bank of America Corporation (BAC), were excluded even though it would seem nearly impossible that depositors would have any risk with them. We also chose to avoid regional banks that are located in the troubled Southeast and the entire Pacific Coast where so many faced financial troubles from housing and lending during and after the recession. We left off some of the large banks that have been involved very recently in mergers and acquisitions. Finally, we absolutely eliminated banks where we had concerns about their viability and survival during another recession.